MIAMI, FL ― March 25, 2019 ― Today, Miami Cancer Institute announced the opening of its Multidisciplinary Skin Cancer Clinic, including the regions’ first (1 of only 12 in the world), 3D whole body photo-imaging system designed to improve the accuracy of diagnosing melanoma and other skin cancers. 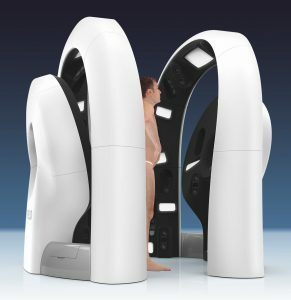 The new technology, also known as the Vectra, uses 92 cameras that take simultaneous photos of the body in one second, and then creates a 3D view of the surface of the skin. This allows the dermatologist to potentially evaluate every suspicious lesion on the skin, both by physical exam and with the use of other sophisticated technology available in the clinic. The Multidisciplinary Skin Cancer Clinic at Miami Cancer Institute will focus on early detection and treatment of melanoma, in addition to treating patients with all types of skin cancer, including basal cell carcinoma, squamous cell carcinoma, Merkel Cell tumors and other rare tumors of the skin. The program’s team of experts includes dermatologists, surgical and medical oncologists, radiation oncologists and plastic and reconstructive surgeons. According to the Florida Cancer Data System, nearly one in 10 Floridians have some form of skin cancer. Studies show that one person dies of melanoma every hour, and rates of non-melanoma skin cancer have increased by 77 percent over the past 10 years. On average, it takes 12 months after noticing a suspicious mark before getting it looked at by an expert. The single most critical factor for improving chances of survival for skin cancer is early detection. Patients need a referral from a dermatologist or oncologist to be seen at the Miami Cancer Institute’s Multi-Disciplinary Skin Cancer Clinic. For more information about these specialized services, patients may call 786-596-2000 in Miami-Dade County or 866-596-2330 toll-free. International patients should ask their physician to contact Baptist International Services at 786-596-2372 or International@BaptistHealth.net. Miami Cancer Institute, part of Baptist Health South Florida, is a next-generation cancer treatment destination known for its leading clinical care and research, compassionate patient experience and state-of-the-art technology – including the first proton therapy center in South Florida, Latin America and the Caribbean, and the only radiation oncology program in the world with each of the latest radiation therapies in one place. The Institute offers an impressive roster of established community oncologists and renowned cancer experts, clinical researchers and genomic scientists recruited from the nation’s top cancer centers. As Florida’s only member of the Memorial Sloan Kettering (MSK) Cancer Alliance, Miami Cancer Institute is part of a deep and functional collaboration that affords patients access to innovative treatments right here at home and ensures that the standards of care developed by our multidisciplinary disease management teams match those at MSK. Heralded nationally as one of the “hybrid” cancer centers of the future, Miami Cancer Institute combines high-quality community-based cancer care with the best of an academic cancer center, including innovative clinical trials tied to research and genomics and disease-specific surgeons, medical oncologists and radiation oncologists who are experts in their fields. For more information, visit MiamiCancerInstitute.com.